Download full license key or serial number Glary Utilities Pro without any cost. Registration code is active for 1-year. To grab just follow instructions shown on this post. Regular price Glary Utilities Professional edition is $39.95 for 1-year can be installed up to 3 PCs. 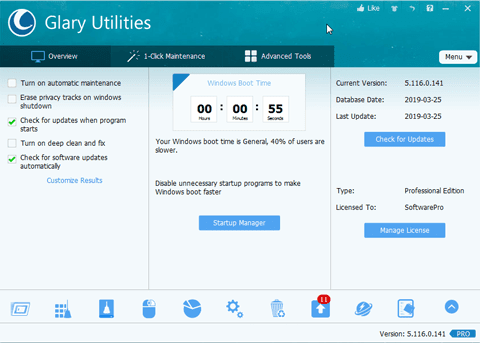 Glary Utilities Pro features premium tools to optimize PC’s performance, fixes PC’s performance, crashes, and freeze problem. This tool can detect and clean junk files, invalid registry entries, and repair settings that potentially crashed system. New version the software is Glary Utilities Pro 5 and installed on over 40 millions PCs / Laptops worldwide. On the short time giveaway, get free 1-year registration code at no cost. It absolutely free during the promo. Giveaway Link Glary Utilities Pro: visit the giveaway page! Scan and analysis your PC and make them up to 800% faster using this utility. Download the full version this all-in-one PC care. Go to or click new giveaway link for this software above. Enter you valid email address and check “I’m not a robot”. Then click on “Get My Key Now”. The license key should be on your inbox after submit the form. Download the installer and use the code on your email to activate all premium tools for 1-year. After free offer or giveaway expires, you can buy the license key. Glary Utilities Pro offered with 50% discount with 90 days money back guaranty. If you need alternative software, I thinks Ashampoo WinOptimizer 2019 and CCleaner Free is best choice.